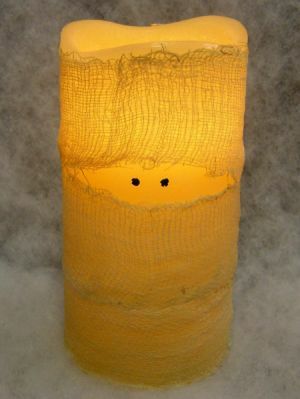 This unique LED candle features a coffee dyed cheesecloth around a candle with hand painted eyes. This mummy looking light uses 3 AAA batteries. 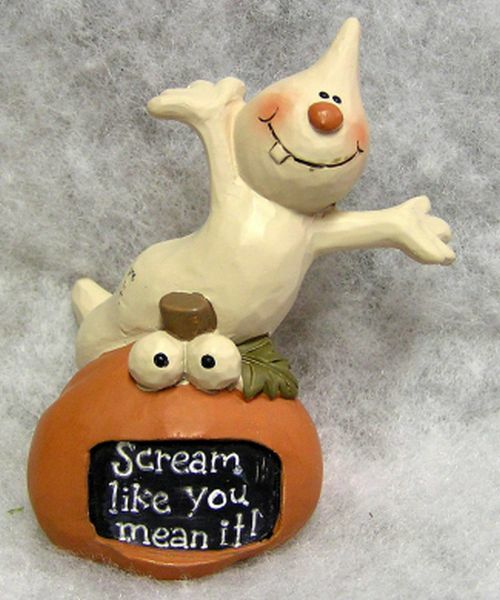 "Mummy knows best" is engraved on a pumpkin. 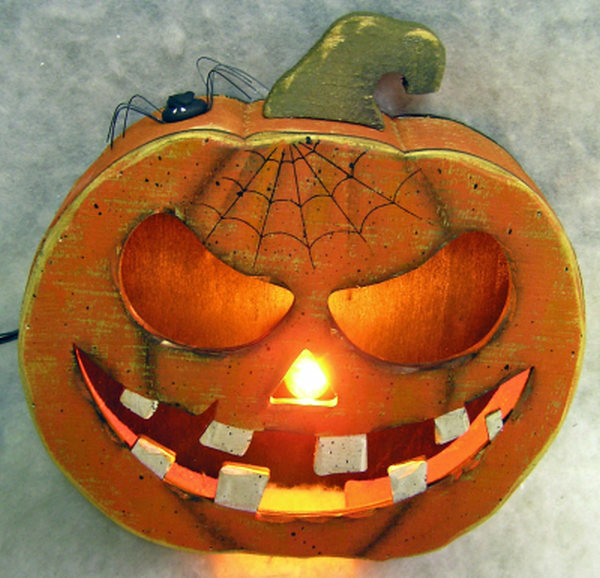 There is a resin mummy holding the pumpkin and he has a big smile. It measures 3 x 3 x 2. 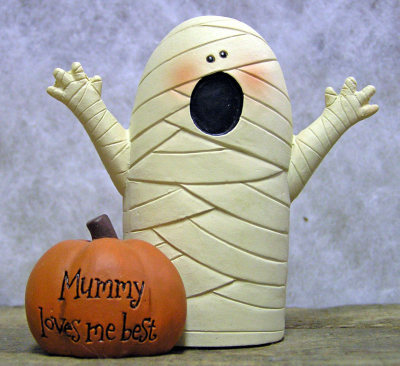 This resin creation features a mummy with a pumpkin in front of it. The pumpkin has "Mummy loves me best" engraved on it. 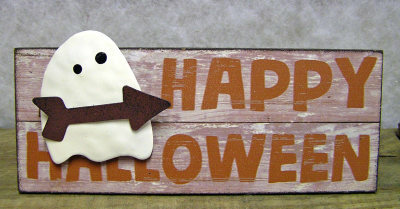 These resin ghosts come in two styles: "EEK" and "BOO". They have big smiles and rosy cheeks and are carrying those words on flag banners. They measure 3 x 3 x 2. A spider with wire legs is sitting on the top of this wooden pumpkin. He has a cut out smile, nose, and eyes and an electric light inside. He measures 10 x 10 x 2 1/2. This resin broom has wire wrapped around it with stars attached. 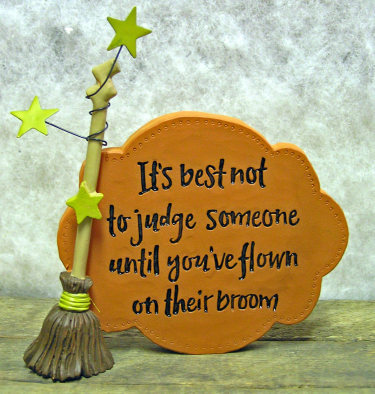 It is propped up against a sign that says "It's best not to judge someone until you've flown on their broom". It measures 4 1/2 x 4 x 1. 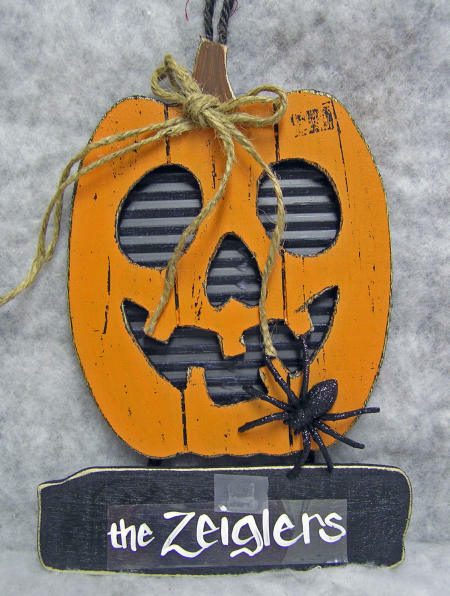 "HAPPY HALLOWEEN" is printed on the front of this wooden sign. It has a metal ghost with tin arrow mounted on the front. There is a stand on the back. It measures 3 1/2 x 8 x 3/4. 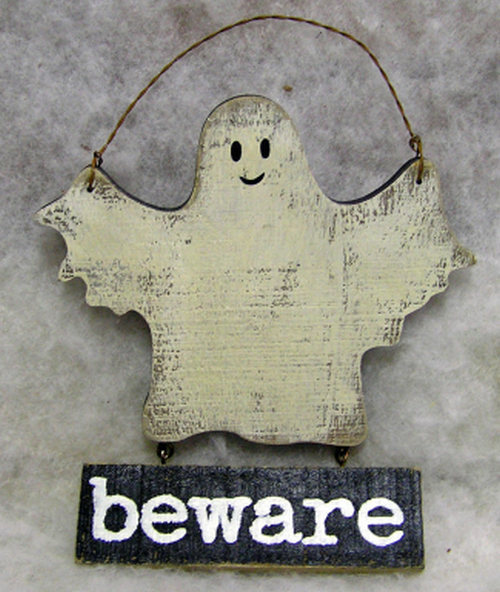 "Beware" is painted on the wooden sign at the bottom of this item. 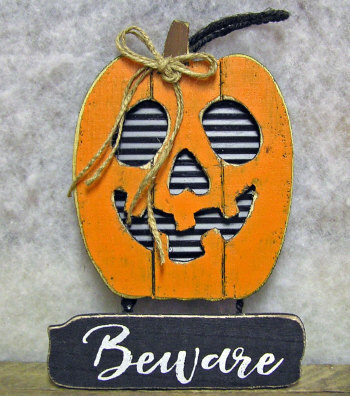 The sign is hanging from a wooden pumpkin that has corrugated metal behind it, a jute bow, and rustic finish. It measures 11 x 7 1/2 x 1 + hanger. 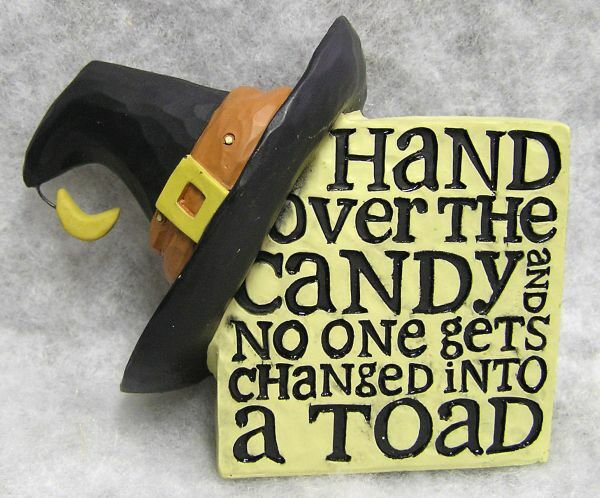 "Let's be wicked together" (shown) and "Hand over the candy and no one gets changed into a toad" (click on photo to see this option) are the two styles of this resin item. 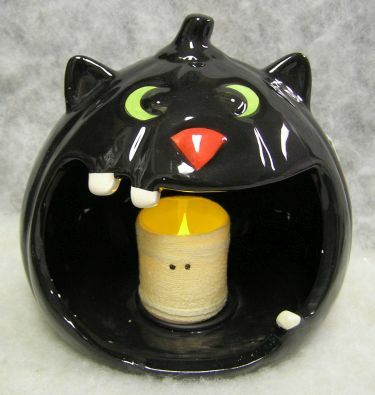 It has a witch's hat on the top with a moon or bat hanging on the end. It measures 3 1/2 x 4 1/2 x 2 1/2. This wooden sign has the letters "B-O-O" mounted on a base. 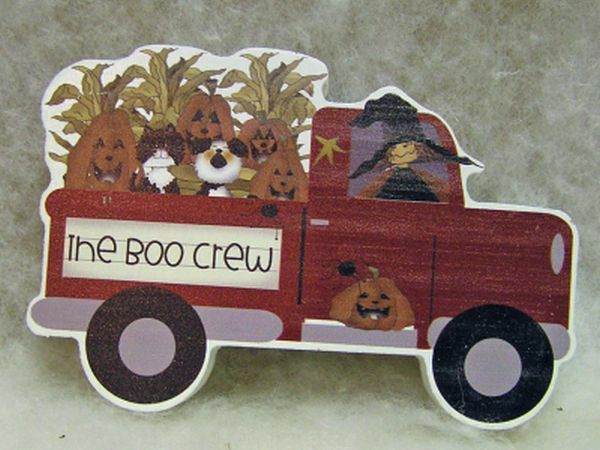 It has a burlap flower with a button on the "O" and a wooden ghost sitting in front of the "B". It measures 4 x 10 x 1 1/2. This happy one toothed resin ghost is sitting on top of a pumpkin. In the pumpkin's mouth it says "Scream like you mean it!". It measures 4 1/2 x 3 x 2 1/2. This wooden Halloween item says "BEWARE" on the sign hanging below the smiling ghost. 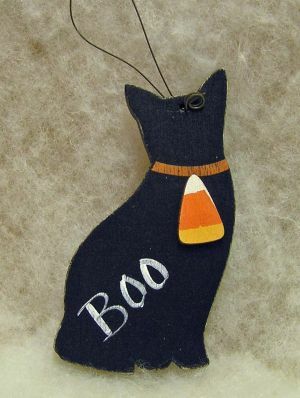 It can be personalized on the ghost, has a rustic finish, and a wire hanger. It measures 8 x 7 x 3/4. 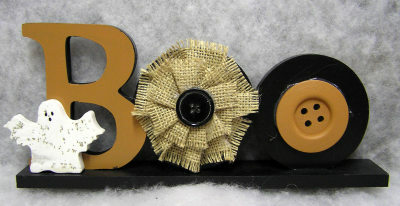 This door knob ring is covered with black cording and has a black bow on it. 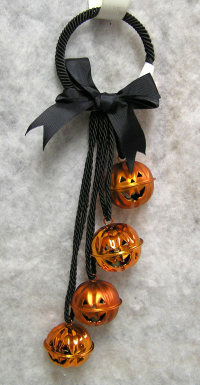 There are 4 pumpkin bells hanging from the ring. It measures 14 x 4 x 2. 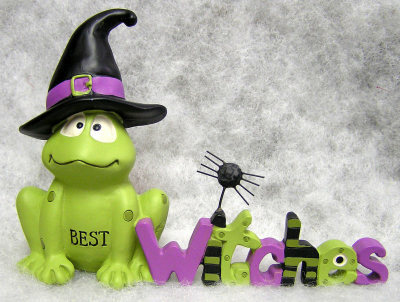 This cute resin frog says "Best" on its belly and the letters "WITCHES" follow it. 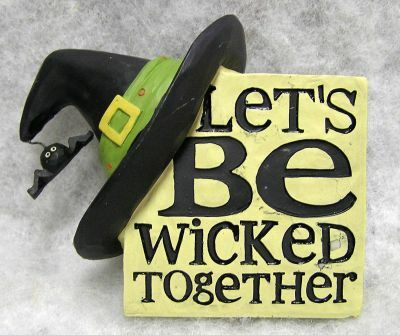 The frog has on a witch's hat and a little spider is sitting on top of the "I". It measures 3 x 4 1/2 x 1 1/2.